We’ve written about the mixed emotions encouraging verses like Jeremiah 29:11 bring. And today’s verse is no different. The writer tells us of meeting God’s never-ending mercies. He says they’re fresh as the morning air. But have you ever actually read Lamentations? If we pluck this verse out of context, it’d be like watching a movie without sound. We might see part of the story, but we miss the true meaning. Lamentations is a collection of songs and poems of lament. And what exactly is the writer, Jeremiah, lamenting? He just saw his city fall to an invading army. He watched its gates burned. He watched as his neighbors and friends and family were killed. Jeremiah’s entire world was falling apart and yet he wrote these words of hope through bitter tears. In previous verses he said things like: “Arise, cry out in the night, at the beginning of the night watches! Pour out your heart like water before the presence of the Lord! Lift your hands to him for the lives of your children, who faint for hunger at the head of every street” (Lamentations 2:19). The picture is of parents pleading for their destitute children in the dark of night. Jeremiah talks about these awful things non-stop and even says he’s forgotten what happiness is (Lamentations 3:17). In his moment of dread and defeat—truth steps in. And he holds onto it. Even though things are horrible around him, he declares that God’s goodness is not contingent upon his situation. 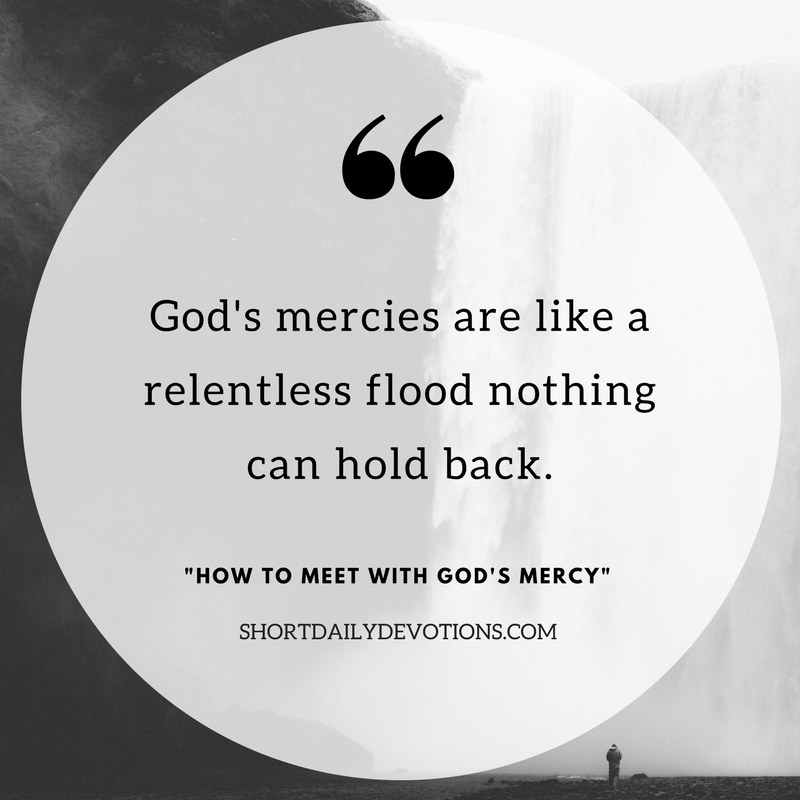 That God’s mercies are like a relentless flood that nothing can hold back. Most of all, he remembers aloud that it’s God himself who is our portion—and he’s the only one in whom we can place our hope. You see, those words are just as true in times of peace as in times of trouble. They’re beyond the “warm-fuzzy phrases” we post on Instagram and Twitter. They’re not simply there to make us feel better when things are hard. They remind us of reality of the gospel. Our God is so good he went on a death march for us. And he’s so powerful that not even death could keep him in the grave. To meet with God’s mercy, we can follow Jeremiah regardless of our situation. We can declare that what was intended for evil, God can—and will—use for good (Genesis 50:20).